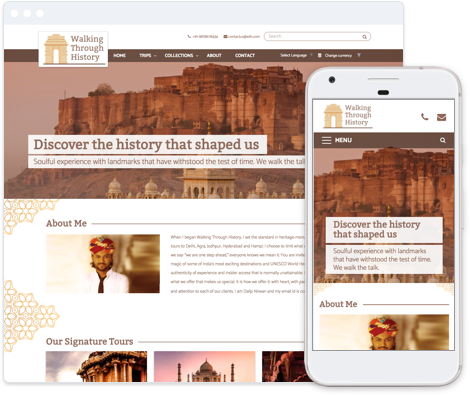 If you organise city tours such as heritage tours, monument tours, or other historical and cultural activities, this retro template will be great for you! Go ahead and create a sample website using this template. Ideal for city tour operators and travel agents selling walking tours, cycling tours, sightseeing tours, food tours, and other similar activities and tours in a local area, like a city or state. Click to see the template. A website template specially designed for operators selling water-sports, scuba-diving, snorkelling, para-sailing, jet ski & other activities. Ideal for adventure tour operators. Click the template to see more. A city tour theme ideal for tour operators selling food tours, city walks, night tours, cycling tours, cultural tours, and other similar products meant to be showcased with large enticing pictures, and short, punchy text. Try out the template! Template is best for adventure tour operators and adventure travel agents selling activities such as trekking, rafting, bungee jumping and everything else. Try the template for a quick overview of what you will get.